March 6, 2012 - GE Aviation announced its agreement with GeoEye to provide the aviation industry with ICAO-compliant terrain and obstacle aeronautical data derived from GeoEye’s high resolution Earth imagery. GE is showcasing this technology at ATC Global this week in Amsterdam. As the first offering under this agreement, GE will provide ICAO Annex 15 Area-2 terrain and obstacle databases to support the development of new Performance-based Navigation (PBN) flight paths around the world. 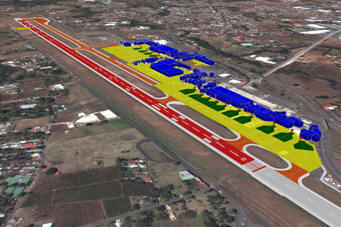 This digital, highly detailed terrain and obstacle mapping, collected by some of the world’s highest-resolution commercial earth-imaging satellites, will support the world's airport, airlines and aviation authorities as they move to adopt PBN. GeoEye is a leading source of geospatial information and insight for decision makers and analysts, who need a clear understanding of our changing world to protect lives, manage risk and optimize resources. Each day, organizations in defense and intelligence, public safety, critical infrastructure, energy and online media rely on GeoEye's imagery, tools and expertise to support important missions around the globe. Widely recognized as a pioneer in high-resolution satellite imagery, GeoEye has evolved into a complete provider of geospatial intelligence solutions. GeoEye's ability to collect, process and analyze massive amounts of geospatial data allows customers to quickly see precise changes on the ground and anticipate where events may occur in the future.